The legendary Calciatori series, the official sticker collection of the Italian league started in 1961/62, proposes for the first time in the season 2016/17 an hardcover version of the sticker album. This hardcover album is simply faboulous, no doubt the best sticker album released for quality of the cover and thickness of each page. The album opens with the introduction of the Italian competition and four shining stickers: Serie A logo and the trophies of the Italian League, Cup, and Supercup. The 20 Serie A clubs are shown in alphabetical order. Each team is displaced over four pages. The first two pages include 22 stickers of players, and the other two pages a large amount of information about the club and six stickers: one shiny sticker about some remarkable players of the current team, one sticker with two young talents (Generazione Z), a fabric sticker with the first uniform, a metallic sticker with the club badge, the team photo, and a shiny sticker of the coach. In between the Serie A and Serie B teams there are four special sections. The first is "Record da campioni" with five stickers of first pages of the famous sport newspaper Gazzetta dello Sport. 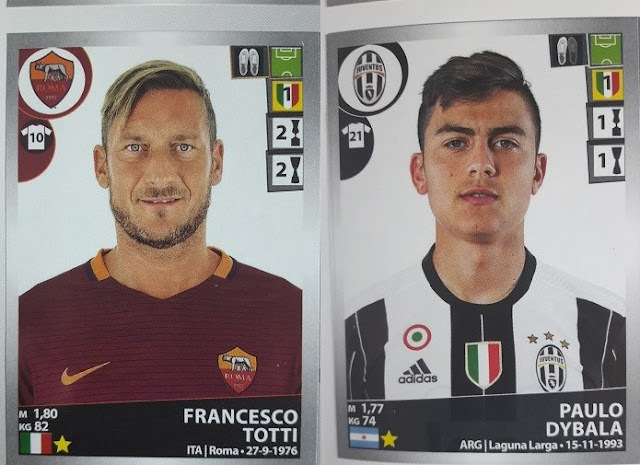 The second is "Raffigura", which presents 11 stickers with caricatures of Serie A players. The third section is the classic space dedicated to the winter transfers (Calciomercato). The 48 stickers of this section can be found in a dedicated update set (Aggiornamenti). In the update set there are also the mini-sticker to glued on top of transferred player ("TRASFERITO") and replaced coaches ("SOSTITUITO"). Last section before Serie B teams is the movie of the season (Film del Campionato). The 20 stickers of this section were sold in four special packets together with the sport magazine Gazzetta dello Sport along the season. They include the main facts and players of the Italian season 2016/2017. Serie B teams are shown in alphabetical order. 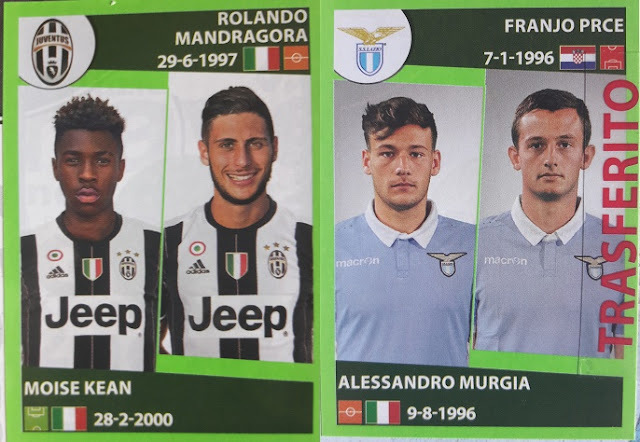 Each team on one page with a total of 7.5 stickers: the metallic club badge (half sticker), the team photo and 6 stickers of players with a total of 18 players (three players per sticker). Spal, Hellas Verona, and Benevento are the three clubs promoted to Serie A at the end of the season 2016/2017. 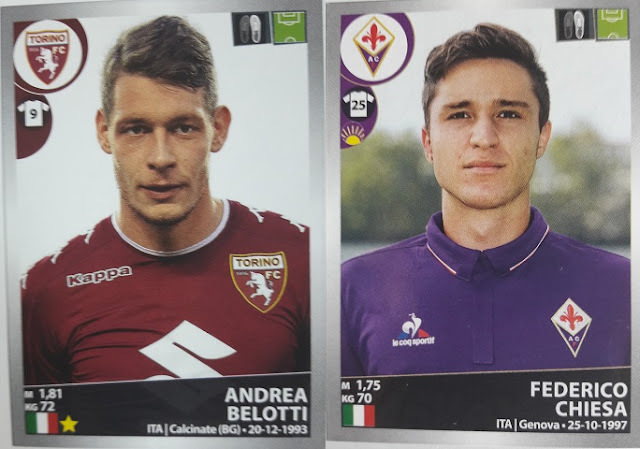 In some lucky sticker packets it is possible to find a winner card that gives right to get a special packet Calciatori GOL. In this packet there is one special shining Calciatori sticker and one tattoo. The series includes 12 special stickers (P1-P12) and 12 tattoo's (T1-T12). A dedicated poster to glue the 12 special stickers is included in the update set (Aggiornamenti).